Where has Mubarak stashed his millions? 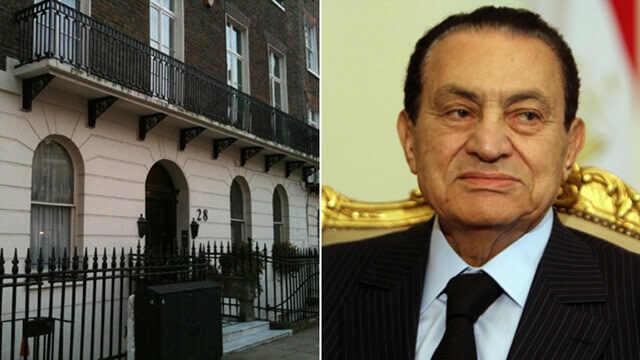 This house (pictured left) in Knightsbridge, central London, is believed to belong to Hosni Mubarak's son, Gamal. (CNN) -- Global efforts are intensifying to seize assets belonging to Egypt's former president, Hosni Mubarak, following the revolution in the north African nation. The former Egyptian leader may now be residing in Sharm el-Sheikh following his flight last week from Cairo -- but where is his fortune? What moves have been made to track down Mubarak's assets? Switzerland's government said Friday it had moved to freeze assets in the country's banks that might belong to Mubarak or his family. The Swiss Cabinet had frozen all funds belonging to Mubarak or "his circles," according to a statement from the Swiss Federal Department of Foreign Affairs. The British government has not yet moved to freeze any assets held in the UK, but the Serious Fraud Office told CNN that they were preparing in case they are asked to do so. Where is Mubarak, where is his money? --Nicholas Shaxson, Chatham House analyst. One UK opposition politician on Sunday urged the government to do more. "I think it would be a very prudent thing to do to freeze suspicious accounts here because it will take a new government quite a while to mount some kind of legal claim on them," said Mark Malloch Brown, a minister in the last Labour government. "It would be a real pity if when they did the money had gone. I think it would be great for the reputation for the City of London if those accounts were frozen now." What is the true value of Mubarak's assets? It is widely believed that Mubarak and his family are extremely wealthy, but estimates as to his total net worth vary widely and haven't been confirmed. Nicholas Shaxson, a Chatham House analyst with specialist knowledge of both Africa and tax havens, suggested to CNN that a conservative figure might be between $1 and $2 billion, although he cautioned that no one outside the family really knows. Global Financial Integrity, a Washington DC-based research and advocacy group, said $57 billion flowed out of Egypt between 2000 and 2008, lending to widespread speculation that some of that money went to corrupt leaders. "The exercise of power is an expensive business in corrupt countries and a dictator will have many supporters to pay off," said Shaxson. "Without wanting to minimize the amount of money allegedly plundered from Egypt by Mubarak, they should be chasing his supporters too." The idea that Mubarak did anything illegal is pure speculation at this point. How do dictators take money out of their countries? It's rarely the case that looted assets are removed from a country in the form of cash in a suitcase, said Shaxson, adding that it's fairly easy to plunder a country when you control the whole political system. What's more likely to happen is that cash is removed through commercial trade deals. "If you buy machinery for instance worth $1 million, you pay $2 million, and the trader might agree to put $1 million into a bank account in a tax haven," explained Shaxson, author of "Treasure Islands: Tax Havens and the Men Who Stole the World." "In that way you can effectively disguise the theft." Where are Mubarak's assets now held? Many of his assets are likely to be in the form of real estate such as property or yachts, Shaxson added. "Mubarak's assets are likely held in places where his family visit and feel comfortable, such as London, Singapore or Dubai. He is also likely to own property in the United States and Switzerland." The family may now be trying to liquidate those assets, according to one author of a book on Mubarak. "I know that some people in London are filing petitions for the freezing of the family's assets," Aladdin Elaasar, author of The Last Pharaoh: Mubarak and the Uncertain Future of Egypt in the Volatile Mid East told The Sunday Times. How successful will attempts to seize his assets be? "The UK, the U.S. and Switzerland are the three main countries where 'dirty money' is laundered, and those countries will want to be seen to be doing something," said Shaxson. "But the bigger picture is the wholesale looting of Egypt. If Switzerland and the UK get away with saying we've found a few hundred million, that disguises the real issue which is the complicity with which Western countries help corrupt leaders in developing nations to loot their citizens, especially by using secretive offshore tax havens, such as Jersey or the Cayman Islands." What problems will investigators face? The main problem in tracking down Mubarak's assets is the many layers of secrecy that disguise ownership. "His houses will not be owned under the name H. Mubarak Esq," Shaxson said. "They might be owned by a trust registered in Cyprus, run through Switzerland for example. There might be up to five layers of secrecy, and devices known as "flee clauses" that the immensely wealthy use to throw investigators off the scent and hinder attempts to seize illegally obtained assets." Have assets belonging to other dictators ever been seized? Yes. Up to $700 million belonging to the family of former Nigerian president Sani Abacha was returned to his own country by Swiss authorities after his death in 1998, according to pressure group Tax Justice Network. Up to $684 million was recovered from the family of Ferdinand Marcos after he was ousted from the Philippines in 1986, it added. But these are drops in the ocean when compared to the total amount looted from developing countries, according to Shaxson. "The UK and Switzerland should not be allowed to get away with saying we've found a few hundred million dollars and leading people to think they are acting against 'dirty money.' Look how quickly Swiss authorities said they were closing down Mubarak's assets: It means they always knew where it was, and they're only doing something about it now because he's in the news." "These countries are complicit in allowing the developing world to loot their citizens." What can be done to clean up the system? The Organisation for Economic Co-operation and Development, an agency at the forefront of a global crackdown on money laundering, is trying to set up a system of exchanging information between tax havens. However Shaxson said the whole system was riddled with holes, as it was only signed between developed countries, not the developing countries from where most money is being looted. "Perhaps more will happen because of the publicity surrounding Mubarak's money though," he said. "There is more of a climate that money laundering is unacceptable now. Because the UK has such huge influence in offshore tax havens it could reform the political system if there is political will." UK Business Secretary Vince Cable told the BBC that his government would act against any British bank involved in helping Mubarak improperly move funds but said London would not act alone. "I wasn't aware that he (Mubarak) had enormous assets here but there clearly needs to be concerted international action on this," Cable told the BBC. "There is no point in one government acting in isolation but certainly we need to look at it. It depends also whether his funds were illegally obtained or improperly obtained."